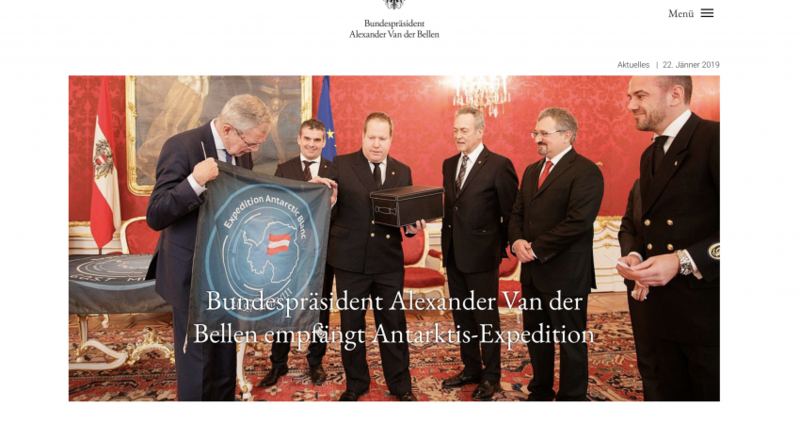 This quote by Austrian President Alexander Van der Bellen has been chosen by the Hofburg‘s prestigious press corps to introduce the article about the reception for Expedition Antarctic Blanc on the President‘s website. The GOST delegation consisting of six members handed over with pride in Vienna’s Hofburg the Antarctic Blanc expedition flag to the President Van der Bellen on January 22, 2019. The ceremony took 30 minutes and the President received an expedition report, watched the official video, signed the flag and had in-depth discussions with the delegates. The president who himself is greatly engaged in environmental topics and climate discussions worldwide has listened carefully how a private initiative as the Global Offshore Sailing Team (GOST) has been able to connect nations, politicians, scientists and the civil society to enter deeper into discussions about important historical, environmental and societal topics. With its expeditions GOST hereby became an ambassador for international understanding. President Van der Bellen also took note that Austria’s ratification of the Environmental Protocol is still missing and is now in contact with the Founding Director of the Austrian Polar Research Institute Prof. Dr. Andreas Richter to examine the topic.